Tango Caravans is a young company but there’s a certain maturity and expertise on show in the Escape. The Australian RV market is overflowing with new caravans. But how many cost less than $50,000? Experience suggests a circa 18ft van with a full-width rear ensuite, independent suspension, solar, 190L of fresh water, and even a BMPro Genius battery management system would normally cost about $55,000, if not 60 large. But as it turned out, that’s not entirely true. I arrived at the Campbellfield, Vic, headquarters of Tango Caravans to find a van that appears to outstrip many of its competitors in the value-for-money stakes. The Escape, you see, might resemble other vans in its class – white aluminium cladding and slightly raked front profile – but, features-wise, it packs a pretty hard wallop. Considering the asking price of $49,990, our review van is an enticing proposition. Tango Caravans was established about a year and a half ago by Sarah Horter. To say caravans are in her DNA would be an understatement. She is the granddaughter of Ian Grant of Ian Grant’s Caravans in Traralgon, Vic, a family business you could fairly describe as an institution on the Australia RV scene. “My mum, dad, grandparents, aunties, uncles and cousins all work there; my pa has had his yard for 30 years or so and had been selling caravans long before that, so even before I began working there I’d go to the yard after school, so caravans have been a massive part of my life for as long as I can remember,” Sarah told GoRV. The van we hitched up was the Tango Escape 18ft 8in. Strictly speaking, our van was actually 18ft 6in; however, future models will be 2in longer in the body so as to allow for a slightly larger bathroom. Stepping inside reveals a light, pleasant interior, with the bedroom in the front, bathroom across the back and everything else in between. Is it a well thought out interior? I think so. The layout is fairly common but certain design cues help to set it apart. Let’s start at the front. Between the bed’s overhead lockers and the bed itself runs a mirror, adding to the sense of internal living space. Naturally, there are wardrobes either side of the bed (each with three drawers), as well as cupboards at the foot of the bed – the offside cupboard contains the Brakesafe unit. All locker doors, in the bedroom and throughout the van, I’ll point out, lift on gas struts and piano hinges – they certainly seem sturdy. The kitchen is equipped with a four-burner cooktop, griller and oven, and a reasonable amount of storage space in the form of drawers, cupboards and overhead lockers. A stereo/DVD player system is mounted into the overhead cabinetry and, in the forward locker, you’ll find a 12V point, 240V point and antenna for the TV – a swivel mounting bracket is fitted to the outside of the cabinet where the telly can be viewed from the bed. It’s a neat installation. I’ve never said this before but I think my favourite feature of the kitchen is the benchtop and colour-matched splashback. The fitment of the bench is good; the colour is great. There’s something welcoming and almost beachy about it. Opposite, the dinette has the the same colour scheme and, sensibly, the hot water service is under the forward dinette seat. I say ‘sensibly’ because these are cumbersome units so it’s better, I believe, to mount them where they won’t take up useable storage space. Access to the under-seat area in the dinette, however, is a little awkward. It’s a matter of wrangling the cushions off or using the hatches facing the kitchen. I personally would prefer a drawer for each. Having said that, the dinette is good and comfortable, with a reading light for each lounge and some storage space above, although one overhead locker is filled with the BMPro Genius battery management system, the 30A regulator for the roof-mounted 150W solar panel, HWS and water pump switches, and the water level indicator. With all controls and switches centralised, the splashback and walls of the van are uncluttered – this small effort makes a big difference to a caravan’s overall presentation. As I alluded to, the bathroom in this van is a little on the narrow side. Thankfully, Tango Caravans is aware of the issue and this model is being extended by 2in so as to give some more elbow room. Features include a cassette toilet on the offside, vanity unit across the rear wall with a top-loading washing machine built in, and nearside shower. I particularly liked the large linen shelf in the offside-rear corner, with a storage compartment below the linen cupboard that can only be accessed from the outside. There’s a large mirror, overhead cabinetry, storage below the washbasin and that same beachy benchtop. The shower is a separate, moulded-fibreglass unit with a ventilation hatch and hand-held shower rose. Overall, the interior of the Tango Caravans Escape gives a positive first impression. It’s light and bright and modern, and the layout is sensible and uncramped (notwithstanding the bathroom situation). The van sits on a 6in ARV DuraGal chassis with Dexter Torflex independent suspension. While the van copes happily with mild to moderate corrugations, I wondered if the independent suspension was overkill. It does, however, allow for an upgraded ATM. In this case, to 2700kg. Up front, you’ll find a 50mm ball coupling and a couple of 9kg gas cylinders – I’d like to see a stoneguard of some variety on the drawbar, if only to protect the gas cylinders. An Anderson plug is mounted to the offside chassis rail so you can plug in a set of portable solar panels to augment the standard roof-mounted panel. Further back is the mains water inlet, mounted behind a chassis member and high enough to put it out of harm’s way. There’s also an external shower hereabouts and, at the very rear, a gal-lined storage compartment. There’s also a tunnel boot at the front, so external storage shouldn’t be a problem. 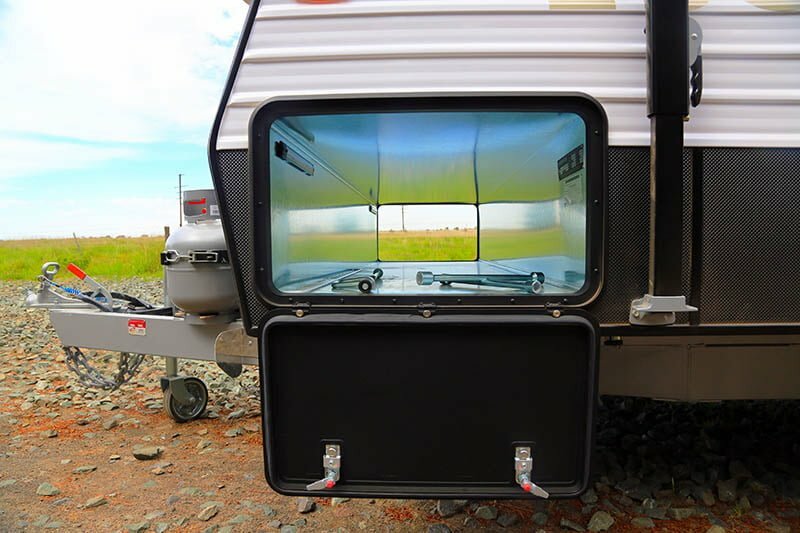 On the nearside is a roll-out awning, a grab-handle at the entrance, a couple of speakers, 12V and 240V powerpoints and awning light, while at the rear you’ll find a reversing camera. I found the Escape to be a fuss-free performer under tow. At highway speeds, it tracked along steadily with little or no side-sway or up-down movement on the ball. This is a good, honest caravan with traditional values. It doesn’t break the mould in terms of how it’s built, but the bang-for-buck factor is high indeed. And, aesthetically, the interior is very appealing. With its sub-2000kg Tare, the Escape 18ft 8in is about right, weight-wise, too. Considering Tango Caravans is such a young company, there’s a certain maturity and expertise on show in the Escape. Perhaps that’s down to Sarah Horter’s family background and lifelong immersion in caravans. Whatever the case, the Escape 18ft 8in deserves a good, long look by anyone in the market for a single-axle tourer.